Large Format Printing - Any Size, Any Quantity - We specialize in unique mediums. Our printer is truly the cream of the crop when it comes to artistic and commercial printing - it allows us to print on mediums up to nearly 2 inches thick and single panels up to 8 feet by 4 feet, and it uses thick acrylic inks that can be built up and layered to essential paint the image onto the surface at up to 1200dpi (dots per inch.) In 2015 it won the Product of the Year Award at SGIA (the biggest print/imaging expo in the US) for the EIGHTH consecutive year, so needless to say we are very proud of our little baby! Size: We can print individual panels up to 8'x4', and we can span an image across multiple panels to create an overall display in limitless sizes. 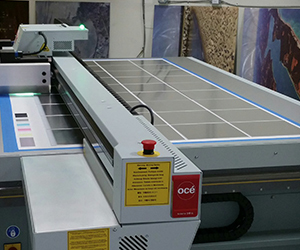 We also have access to a facility with a 10'x8' printing bed if needed. 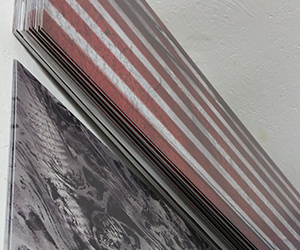 Metal Giclée Prints: Obviously a huge focus of ours is printing on steel and aluminum. Whether it be a wall art print or a logo sign for businesses, printing on metal is what really kicked this off for us. We can print transparent colors over swirl patterns in the metal to give a metallic and holographic effect, or we can print opaque colors to give a super vibrant, crisp display, and in both cases we can top it off with a glossy automotive finish to give it that spectacular "new car" finish that can really only be achieved with metal art. We call these ultra high resolution prints our "metal giclées." Gallery-Wrapped Canvas Giclées: Since we can print on media up to nearly 2" thick, we are able to print on gallery-wrapped canvases with internal wood frames, all stretched and ready to hang. With our ultra high definition printing capabilities we are able to produce spectacular giclée prints on canvas. 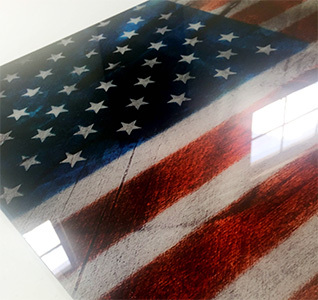 In summary, our top of the line Canon Oce Arizona large format printer allows us to customize all of our own designs upon request, specialize in unique mediums, and open up our printing services at extremely competitive rates for commercial, corporate, hospitality, and large scale residential installations.